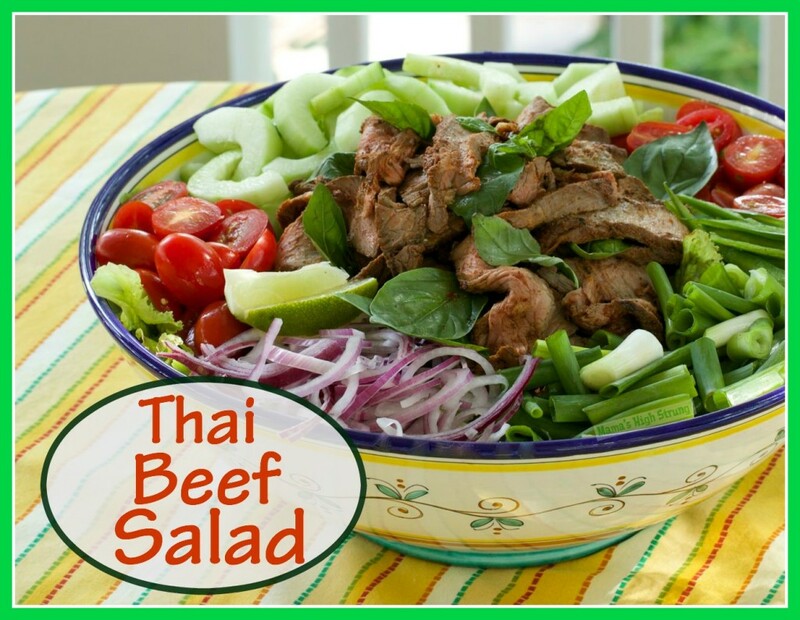 Whenever I make steak, I always make extra so that with the leftovers I can prepare my favorite summer dish: Thai Beef Salad. The beauty of this salad is that you don’t have to include all of the ingredients. If you don’t have fish sauce, use soy sauce. Don’t like jalapeños… leave them out. You can add what you do have… like red or green peppers, cooked zucchini, broccoli or green beans. This is pretty much a “clean the fridge” type of salad with a whole lot of flavor. Pulse the juice, fish sauce, basil, garlic and ginger (if using) in a blender until mixed; set aside. Place the steak, cucumber, tomatoes, onions and pepper in a large bowl or in a gallon-size resealable Ziploc bag. Add dressing to the meat and vegetables and toss gently. Let marinate for at least 30-minutes if possible. Place lettuce in a large bowl. 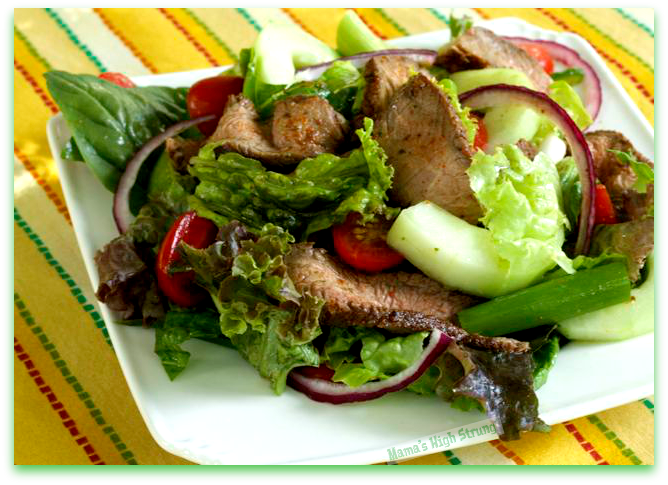 Pour beef, vegetables and dressing onto lettuce and toss gently. Top with chopped basil leaves. Try cooked shrimp or shredded chicken instead of the beef. Fish sauce can be found in the ethnic section of your grocery store with the Asian or Thai foods. If you can’t find it, substitute soy sauce. Thanks Bill! I like using grilled steak! it looks great Chris! 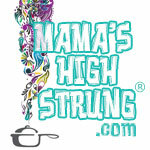 : ) Love the flavors, and no one uses beef on salads enough I tell ya! I agree 1,0000 percent!!! I love beef on my salad, Alice! Thanks for the invitation, Carole! I’ll add it right now! This salad looks delicious. I love Thai food. Yes, me too. I think it is the fish sauce!